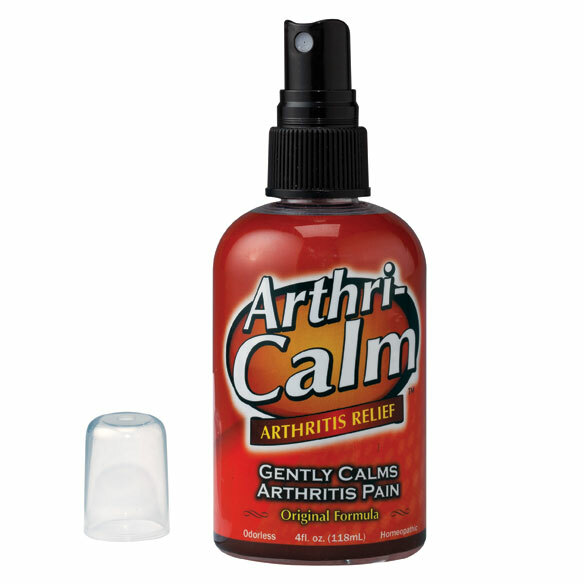 Arthri-Calm arthritis relief spray relieves arthritis pain without drugs or odors. All-natural magnesium pain relief spray formula penetrates deep into joints and muscles to help alleviate pain, stiffness and weakness. Absorbed magnesium helps reduce pain transmitters called substance-P, which are the root of pain. Apply 4 – 8 sprays to painful areas and rub in. Arthritis spray is for tor topical use only. Apply 4-8 sprays to areas with Arthritis pain. Rub thoroughly. For convenience, spray into hand first then apply. DO NOT use more than 100 sprays in a 24 hour period. I will buy this arthritis relief spray. I have aching hands and need relief. I have used it before and I like it. I have pain in my upper right thigh. When I walk the back of my right thigh hurts. suffer from pain in my hands and have tried everything else so why not this.IF it helps I will surely reorder. having arthritic wrist pain. hope this works. i have tried several products that did not work. I chose this for the pain, I just hope it works, first time for me to purchase all these items. My husband is in a lot of pain in his shoulders, arms and knees. Serious problems in finding relief from pain. Trying everything. Chronic pain in hips and lower back. 85 years old male. Doctors and OTC meds can't solve the problem. I'm ready to try anything since I experience pain every day (for 40 years). husband needed it for his sore muscles. does it burn the skin? BEST ANSWER: I've used Arthri-Calm on my shoulder for about 6 months - usually several times each week. It does not burn or create any other condition. When gently rubbed in it tends to ease the arthritic pain and makes my shoulder fully functional again. I recommend it. No it does not burn your skin. It gives you a cooling effect on the area where you apply it. definitely not,i have used it several times.it does seem to work.